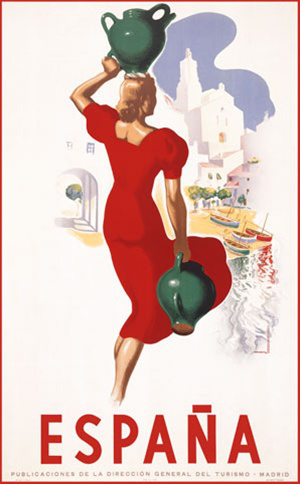 This first poster gave rise to Wendy’s red dress, the matching red title and the “impressionistic” sky against a cream backdrop. I felt this vintage look would help the title, and Wendy, “pop” and grab the reader. The online book market is a thumbnail-driven world, so I needed both the central figure and the catchy title of this book to stand out. 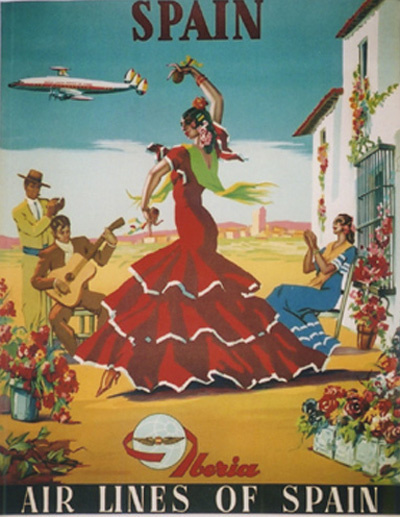 The Iberia Air poster inspired the Wendy’s flamenco moves and better reflects the dress in the final artwork. An early author-created cover design for SOS more directly borrowed from this poster, with characters from the book taking the place of the people surrounding the dancer. 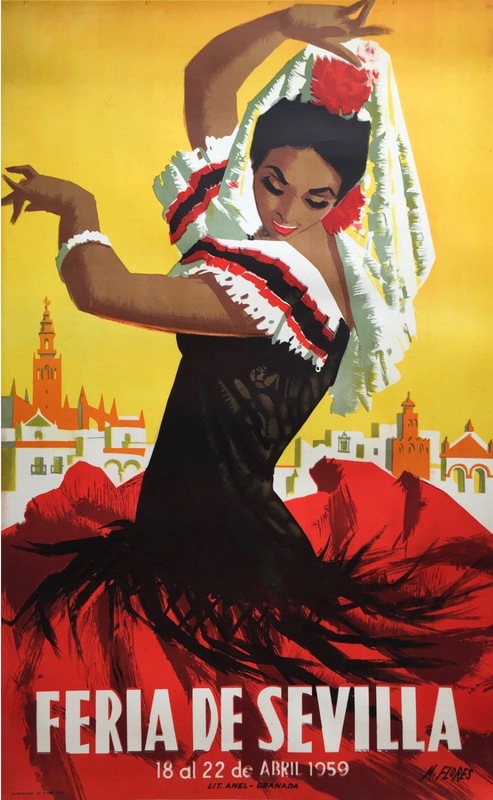 The iconic skyline of Seville is featured in countless travel posters, almost always containing La Giralda, the bell tower of the Seville Cathedral. As the Cathedral serves as a backdrop for an important scene in the story I felt this worked. The sword that Wendy is holding is based upon a real-life sword attributed to Hernan Cortés. 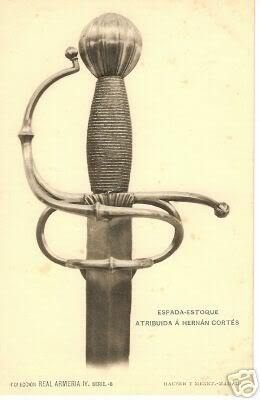 This sword is listed in an extensive 1907 catalogue of the Spanish Royal Armory in Madrid, which you can find here (note: it’s long!). A sword like this features prominently in the tale … but I don’t want to give too much away! 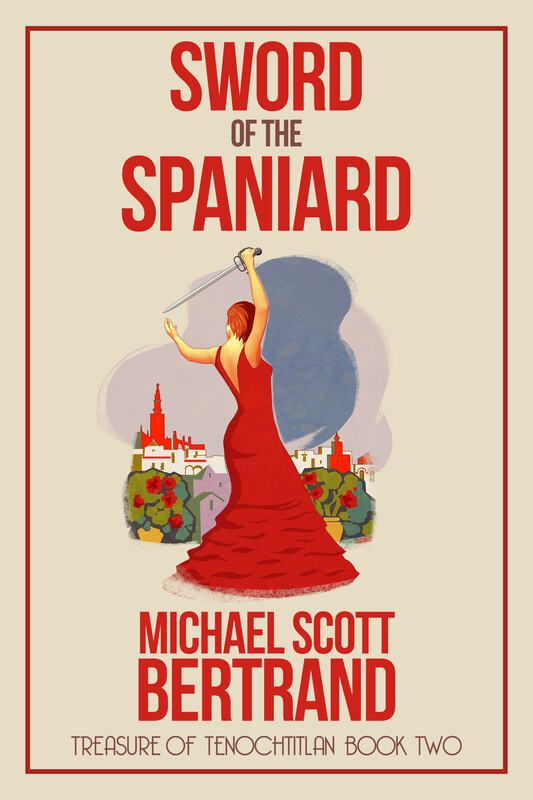 Side note: for both Flying Conquistadors and Sword of the Spaniard, I had Alan do the cover art long before the manuscript was finished. 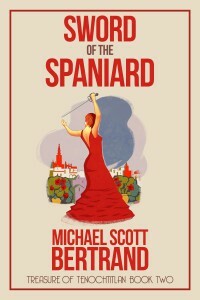 I had the Sword of the Spaniard cover hanging on my office wall for a full year as I completed the book! I find having the cover in front of you is a great motivator, an extra kick-in-the-pants to keep a writer glued to her/his keyboard. Check out more of Alan Flinn’s work at his website! 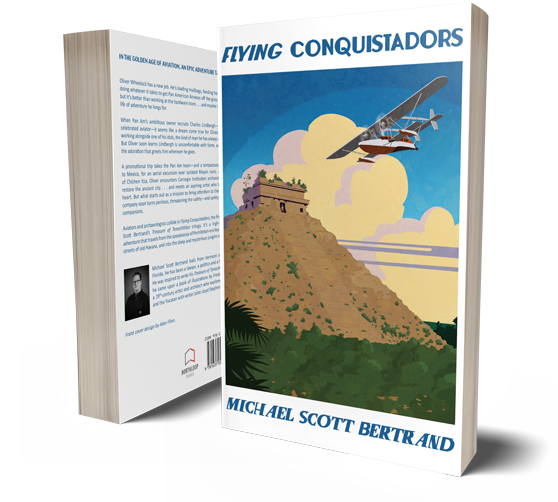 To read about the Flying Conquistadors cover, click here! SWORD OF THE SPANIARD, the second story in my Treasure of Tenochtitlan trilogy, is out today! You can find it at Amazon, Barnes & Noble, Kobo, Apple Books, Playster and Baker & Taylor. The 6×9 paperback version is exclusive to Amazon for now, but you’ll be able to order it from other retailers shortly. The ebook version is retailing for $2.99! No, that’s not a typo … $2.99! The gorgeous paperback will cost you a modest $18.99. Makes a perfect holiday gift for family and friends! Click the front cover below (or click here) to buy the ebook. For the paperback, click here!